Personal, poignant and fierce with passion for life and the sacred, Rumi: Tales to Live By will leave you with heart-wrenching gratitude for life’s trials and gifts. Approaching the final days of his life, the great Sufi mystic Rumi penned down the wisdom he had gained over the years into a spiritual masterpiece known as the Mathnawi. 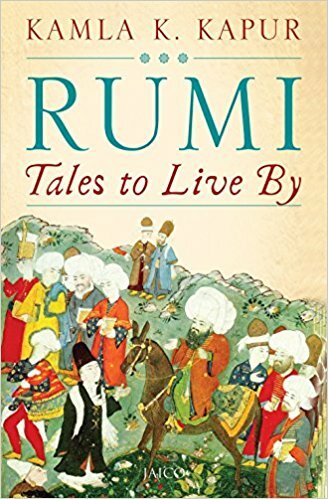 A rich and insightful retelling of his work, Rumi: Tales to Live By is a sweet, comforting and at times, fiery guide to nourish the spirit. Against the backdrop of modern times and issues, Rumi’s sketches of humanity show a new generation of spiritual seekers how to live through the trials and tribulations of life, illuminating even the darkest of paths with divine light. Award-winning author Kamla Kapur further enhances the read with personal experiences from her own journey, making the narrative an enchanting mix of the real and the wondrous. Touching, passionate and sparkling, her commentary on these sometime forgotten but beloved stories clears the clouds of confusion and inspires in readers the strength to follow The Way. Kamla K. Kapur is a bestselling poet, author and playwright. Kapur taught courses in play writing, poetry, creative nonfiction, fiction, mythology, Shakespeare and women’s literature at Grossmont College in California for eighteen years. She and her husband divide their year living in the Kullu Valley in the Indian Himalayas and in Southern California.